The Taijitu represents the concepts of yin and yang. The Chinese characters indicate: "Using no way as way" and "Having no limitation as limitation". The arrows represent the endless interaction between yang and yin. Jeet Kune Do (Chinese: 截拳道; Cantonese Yale: jiht kyùhn douh; [tsìːt̚.kʰy̏ːn.tòu]), or "The way of the intercepting fist" in Cantonese, abbreviated JKD, is a hybrid philosophy of martial arts heavily influenced by the personal philosophy and experiences of martial artist Bruce Lee. 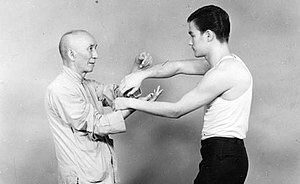 Lee, who founded the system on July 9, 1967, referred to it as "non-classical", suggesting that it is a formless form of Chinese Kung Fu. Unlike more traditional martial arts, Jeet Kune Do is not fixed or patterned and is a philosophy with guiding ideas. Named for the Wing Chun concept of interception or attacking when one's opponent is about to attack, Jeet Kune Do's practitioners believe in minimal effort with maximum effect. On January 10, 1996, the Bruce Lee Foundation decided to use the name Jun Fan Jeet Kune Do (振藩截拳道) to refer to the martial arts system which Lee founded; "Jun Fan" being Lee's Chinese given name. It is referenced in the screenplay of the 1973 Warner Brothers film, Enter the Dragon, when Lee is asked, "What's your style?" Lee replied, "My style?...You can call it the art of fighting without fighting." Lee believed that kata forms and martial art tournament matches alike (like Karate) were simply "organised despair" . He believed that in order to "fully express oneself, one must"[This quote needs a citation] "have no limitations"[This quote needs a citation] (kata and rigid and non-flowing movements being the limitation). His system was new, and included all possible forms of strikes: attacks to the groin, finger jab to the eye. The name Jeet Kune Do was often said by Lee to be just a name, and he often referred to it as "the art of expressing the human body" in his writings and in interviews. Through his studies Lee came to believe that other styles had become too rigid and unrealistic. He called martial art competitions of the day "dry land swimming"[This quote needs a citation]. He believed real combat was spontaneous, and a martial artist cannot predict it, but only react, and a good martial artist should "be like water"—move fluidly without hesitation. JKD as it has survived since—if one views it "refined" as a product, not a process—is what was left at the time of Lee's death. It is the result of the lifelong martial arts development process he went through. Lee stated his concept does not add more and more things on top of each other to form a system, but rather selects the best thereof. The metaphor Lee borrowed from Chan Buddhism was of constantly filling a cup with water, and then emptying it, used for describing Lee's philosophy of "casting off what is useless"[This quote needs a citation]. He used the sculptor's mentality of beginning with a lump of clay and removing the material which constituted the "unessentials"; the end result was what he considered to be the bare combat essentials, or JKD. The dominant or strongest hand should lead because it would perform a greater percentage of the work. Lee minimized the use of other stances except when circumstances warranted such actions. Although the On-Guard position is a formidable overall stance, it is by no means the only one. Lee acknowledged there were times when other positions should be used. He felt the dynamic property of JKD was what enabled its practitioners to adapt to the constant changes and fluctuations of live combat. He believed these decisions should be made within the context of "real combat" and/or "all out sparring" and that it was only in this environment that a practitioner could actually deem a technique worthy of adoption. Lee believed that real combat was alive and dynamic. Circumstances in a fight change from millisecond to millisecond. Thus, he believed, pre-arranged patterns and techniques are not adequate in dealing with such a changing situation. As an antidote to this line of thought, Lee once wrote an epitaph which read: 'In memory of a once fluid man, crammed and distorted by the classical mess.' The "classical mess" in this instance was what Lee thought of the "not too alive way of the classical kung fu styles". The following are principles that Lee incorporated into Jeet Kune Do. He felt them universal combat truths that were self-evident, and would lead to combat success if followed. Familiarity with each of the "four ranges of combat", in particular, is thought to be instrumental in becoming a "total" martial artist. JKD teaches that the best defense is a strong offense, hence the principle of an "intercepting fist". For someone to attack another hand-to-hand, the attacker must approach the target. This provides an opportunity for the attacked person to "intercept" the attacking movement. The principle of interception may be applied to more than intercepting physical attacks; non-verbal cues (subtle movements of which opponent may be unaware) may also be perceived or "intercepted", and thus used to one's advantage. The "five ways of attack", categories which help JKD practitioners organize their fighting repertoire, comprise the offensive teachings of JKD. The concepts of "Stop hits & stop kicks," and "Simultaneous parrying & punching," based on the concept of single fluid motions which attack while defending (in systems such as épée fencing and Wing Chun), compose JKD's defensive teachings. These were modified for unarmed combat and implemented into the JKD framework by Lee to complement the principle of interception. Seen in many of his movie fight scenes such as in The Way of the Dragon vs Chuck Norris, Bruce Lee fought in a side southpaw horse stance. His jabs and crosses came from his right hand and followed up with a lot of side kicks. Instead of a common check seen in muay thai, Bruce uses an oblique leg kick to block a potential kick. He adopted other defensive concepts found in many other systems such as slipping and rolling from Western boxing and forearm blocks found in Eastern martial arts such as Kung Fu. Lee's nimble and agile skipping-like footwork is seen in his movies. This technique was adopted from Muhammad Ali's footwork in his boxing stance. This footwork can be achieved from practice using a jump rope as jumping rope imitates this nimble, jumpy action that is a quick way to maneuvre your way around and away from an enemy's strikes. The footwork also has its influences from fencing. Lee felt that explosive attacks without telegraphing signs of intent were best. He argued that the attacks should catch the opponent off-guard, throwing them off their balance and leaving them unable to defend against further attacks. "The concept behind this is that when you initiate your punch without any forewarning, such as tensing your shoulders or moving your foot or body, the opponent will not have enough time to react," Lee wrote. The key is that one must keep one's body and arms loose, weaving one's arms slightly and only becoming tense upon impact. Lee wanted no wind-up movements or "get ready poses" to prelude any JKD attacks. He explained that any twitches or slight movements before striking should be avoided as they will give the opponent signs or hints as to what is being planned and then they will be able to strike first while one is preparing an attack. Consequently, non-telegraphed movement is believed to be an essential part of Jeet Kune Do philosophy. Lee emphasized that every situation, in fighting or in everyday life, is varied. To obtain victory, therefore, it is believed essential not to be rigid, but to be fluid and adaptable to any situation. Lee compared it to being like water, saying "Empty your mind, be formless, shapeless, like water. If you put water into a cup, it becomes the cup. You put water into a bottle and it becomes the bottle. You put it in a teapot it becomes the teapot. Now water can flow, or it can crash. Be water, my friend." His theory behind this was that one must be able to function in any scenario one is thrown into and should react accordingly. One should know when to speed up or slow down, when to expand and when to contract, and when to remain flowing and when to crash. It is the awareness that both life and fighting can be shapeless and ever changing that allows one to be able to adapt to those changes instantaneously and bring forth the appropriate solution. Lee did not believe in styles and felt that every person and situation is different and not everyone fits into a mold; one must remain flexible in order to obtain new knowledge and victory in both life and combat. It is believed that one must never become stagnant in the mind or method, always evolving and moving towards improving oneself. This is meant to help a practitioner conserve both energy and time, two crucial components in a physical confrontation. Maximized force seeks to end the battle quickly due to the amount of damage inflicted upon the opponent. Rapidity aims to reach the target before the opponent can react, which is half-beat faster timing, as taught in Wing Chun and Western boxing. Learned techniques are utilized in JKD to apply these principles to a variety of situations. "When the distance is wide, the attacking opponent requires some sort of preparation. Therefore, attack him on his preparation of attack. To reach me, you must move to me. Your attack offers me an opportunity to intercept you. "[This quote needs a citation] This means intercepting an opponent's attack with an attack of one's own instead of simply blocking it. It is for this concept Jeet Kune Do is named. JKD practitioners believe that this is the most difficult defensive skill to develop. This strategy is a feature of some traditional Chinese martial arts as Wing Chun, as well as an essential component of European épée Fencing. Stop hits and kicks utilize the principle of economy of motion by combining attack and defense into one movement, thus minimizing the "time" element. When confronting an incoming attack, the attack is parried or deflected, and a counterattack is delivered simultaneously. This is not as advanced as a stop hit but more effective than blocking and counterattacking in sequence. Practiced in some Chinese martial arts such as Wing Chun, it is also known in Krav Maga as "bursting". Simultaneous parrying and punching utilizes the principle of economy of motion by combining attack and defense into one movement, thus minimizing the "time" element and maximising the "energy" element. Efficiency is gained by utilizing a parry rather than a block. By definition a "block" stops an attack, whereas a parry merely re-directs it. Redirection has two advantages, it requires less energy to execute and utilizes the opponent's energy against them by creating an imbalance. Efficiency is gained in that the opponent has less time to react to an incoming attack, since they are still withdrawing from their original attack. JKD practitioners believe they should direct their kicks, as in Wing Chun, to their opponent's shins, knees, thighs, and midsection. These targets are the closest to the feet, provide more stability and are more difficult to defend against. Maintaining low kicks utilizes the principle of economy of motion by reducing the distance a kick must travel, thus minimizing the "time" element. However, as with all other JKD principles nothing is set in stone. If a target of opportunity presents itself, even a target above the waist, one could take advantage and not be hampered by this principle. Jeet Kune Do students train in each of the aforementioned ranges equally. According to Lee, this range of training serves to differentiate JKD from other martial arts. He stated that most but not all traditional martial arts systems specialize in training at one or two ranges. His theories have been especially influential and substantiated in the field of mixed martial arts, as the MMA Phases of Combat are essentially the same concept as the JKD combat ranges. As a historic note, the ranges in JKD have evolved over time. Initially the ranges were categorized as short or close, medium, and long range. These terms proved ambiguous and eventually evolved into their more descriptive forms, although some may still prefer these original three categories. Punching from the Wing Chun centerline. The centerline can be expressed as the height of a triangle. An animation of mechanical linkage to the shoulders of the triangle illustrates the importance of guarding the centerline. Protect and maintain your own centerline while you control and exploit your opponent's. This notion is closely related to maintaining control of the center squares in the strategic game chess. The concept is naturally present in xiangqi (Chinese chess), where an "X" is drawn on the game board, in front of both players' general and advisors. Another aspect of realistic martial arts training fundamental to JKD is what Lee referred to as "aliveness". This is the concept of training techniques with an unwilling assistant who offers resistance. He made a reference to this concept in his famous quote "Boards don't hit back!" Because of this perspective of realism and aliveness, Lee utilized safety gear from various other contact sports to allow him to spar with opponents "full out". This approach to training allowed practitioners to come as close as possible to real combat situations with a high degree of safety. To keep up with the demand of Jeet Kune Do combat, the practitioner must condition their body. Some exercises Lee did included Da Sam Sing or Gak Sam Sing which is a traditional method of forearm conditioning practised in Classical Kung Fu. He also did exercises simulating a fight against a four-limbed human using the traditional Mook Yan Jong (Cantonese) used in Wing Chun. Bruce Lee was an avid follower of Indian wrestler Great Gama's training routine. He read articles about him and how he employed his exercises to build his legendary strength for wrestling, quickly incorporating them into his own routine. The training routines Lee used included "the cat stretch", "the squat" (known as "baithak"), and also known as the "deep-knee bend." ^ Bruce Lee (1973). Enter the Dragon (Motion Picture). Event occurs at[time needed]. ^ a b Lee, Bruce (1975). The Tao of Jeet Kune Do. Ohara Publications. p. 14. ISBN 0897502027. ^ Lee, Bruce (September 1971), "Liberate Yourself From Classical Karate", Black Belt Magazine, Rainbow Publications, Inc., vol. 9 no. 9, p. 24. ^ "Letters of Note: IN MEMORY OF A ONCE FLUID MAN". 25 April 2011. Retrieved 22 June 2016. ^ Hochheim, W. Hoch (January 1995), "The Maze of Jeet Kune Do", Black Belt Magazine, Rainbow Publications, Inc., vol. 33 no. 1, p. 110. ^ a b c Lee, Bruce (2011). Tao of Jeet Kune Do. Valencia: Black Belt. ^ Lee, Bruce (2008). Bruce Lee's Fighting Method. Valencia: Black Belt. ^ Lee, Bruce (1966). Pierre Barton Show. Hong Kong: Pierre Barton. ^ Little, John (1973). Bruce Lee: In His Own Words (DVD). Warner Brothers. ^ Chu, Robert (September 1991). "The Wing Chun Mind: Learn to Think Like a True Fighter". hawkinscheung.com. Inside Kung Fu. Archived from the original on 16 February 2013. ^ Cheng, David (15 July 2004). Jeet Kune Do Basics. Tuttle Publishing. p. 146. ISBN 978-0-8048-3542-8. ^ "Page not found – Huwshimi & Friends". Archived from the original on 2 June 2016. Retrieved 22 June 2016. ^ "Fighting Ranges of Jeet Kune Do, Part 1". 9 December 2013. Retrieved 24 November 2018. ^ a b Argyridis, Panayiotis (12 October 2010). The Principles Theories and Practice of Jun Fan Gung Fu/Jeet Kune Do Vol.1. Xlibris Corporation. pp. 120–122. ISBN 978-1-4535-0635-6. ^ David; Lumsden, Kevin (23 June 2010). The Iron Dragon: Richard Bustillo. Xlibris Corporation. p. 193. ISBN 978-1-4535-1025-4. ^ "Bruce Lee Quotes". Archived from the original on 10 December 2011. Retrieved 25 February 2012. ^ Weiss, Adam. "Bruce Lee Sparring Tips". www.martialartssparring.org. Retrieved 25 November 2018. ^ "Training | Fundamentals | Canadian Hung Kuen Association | Regina Saskatchewan". www.fuhok.com. Retrieved 25 November 2018. Assli, Salem (2002). Jeet Kune Do 'Toutes les techniques de Bruce Lee'. Editions Chiron. ISBN 2-7027-0693-2.